Medellin’s flower festival is upon us. I have been in Medellin for five Flower Festivals now, and have had a blast at each one. 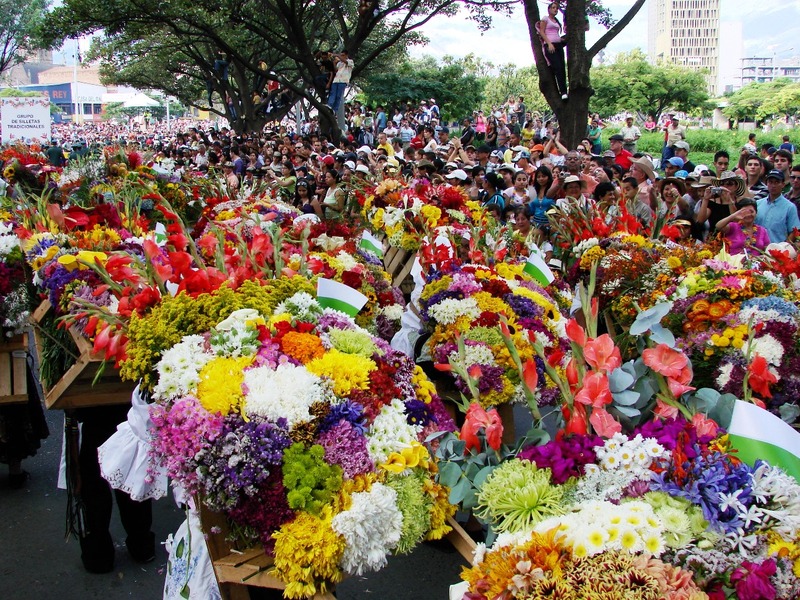 The Medellin Flower Festival has been going on for 58 years now. It is very rich in history and people from all over the world come to see, namely, the “silletero” parade. The Medellin Flower Festival is a celebration of many things, the flowers grown in the region, Virgin Mary Day, and the end of slavery. The Flower Festival started on May 1st, 1957. It was organized by member of the Board of the Office of Development and Tourism, Arturo Uribe. This first flower festival lasted five days with an exposition of flowers displayed in the Metropolitan Cathedral, which was organized by the Gardening Club of Medellín and monsignor Tulio Botero to celebrate Virgin Mary day. The flower parade also celebrates the abolition of slavery. Slaves used to have to carry people on their backs on a contraption called a silleta up steep hills. In the main attraction of the parade, flower farmers called silleteros, carry ornate flower arrangements on their backs instead of people. Despite walking many kilometers this Silletero smiles as he greets the crowd. What does Feria de Las Flores mean to me? For me this the flower festival is a time to spend with friends: dancing, drinking, barbecuing, and experiencing Medellin’s culture. I lived in the United States for 28 years. The U.S. is very big on parades, and living near Los Angeles I am no stranger to them. Next to el Carnaval de Barranquilla, Feria de las Flores is my favorite festival in Colombia. Paisas truly know how to party. Food, drinks, music, and dancing till dawn, I should have been born a Paisa! the Silletero Parade we will be partying at the houses where the silletas are made. I can’t wait! Info: In the middle of the giant Santafe Mall there will be a giant flower carpet made up of more than 26,000 flowers. For the very first time it’ll have a 3D effect to it because it will also be about 12 meters in height. This will be displayed throughout all the Feria de Flores. Info: This is a free concert and it attracts over 3,000 people to the street, so get there early. Location: Obelisco, on the street in front of the stadium, not in the stadium. Info: stalls are put up and decorated to represent different pueblos in Antioquia. Each have tables and chairs. They serve typical food from the pueblo and of course lots of aguardiente and beer. I’ll definitely be going to this. Location: Parque Juan Pablo II. Location: Teatro Universidad de Medellín. Info: “La Tribu” puts on a great show with many surprises and musical guests. It is catered by Andrés Carne de Res so there’s good food and great music. Info: This is a kid parade where the kids go by on their wooden stick horse which they make and decorate themselves. Info: If you love motorcycles, this is the parade for you. Over 600 motorcycles parade across the city and end up in Parque Lleras. Info: This is a bike parade that you can be part of. Anyone with a bike can join. Info: I couldn’t find any info on this event, but it’s free and it looks like it’ll be music. Info: This is an event that features great storytellers. If you don’t speak Spanish this would be a waste of time and money. Location: Teatro Ateneo Porfirio Barba Jacob. Info: I don’t know any of the people performing at this concert. Info: This is a dog parade that anyone can join. It’s a 3.5 kilometer walk. Info: I have no idea who these artists are but here’s their facebook page. This is an event that features great storytellers. If you don’t speak Spanish this would be a waste of time and money. Info: It’s a christian concert and this is their facebook page. Info: This is a big horse fair. I know nothing about horses, never even ridden a horse, but from what I read it looks pretty cool. Concert – Richie Ray & Bobby Cruz con las estrellas de la Fania: Richie Ray & Bobby Cruz, Ismael Miranda, Bobby Valentín, Adalberto Santiago y Andy Montañez. Artists: Jimmy Gutiérrez, Los Rayos de México, Darío Gómez, Amín El Chiche, Nelson Velásquez, Los Morales (Miguel y Los K homenaje a Kaleth), Jean Carlos Centeno, Alex Manga. Location: Centro de eventos la Macarena. Info: Live music, theater, and traditional dancing. Info: this is a 3 day event with various techno and electronica DJs. I don’t know much about this concert or this type of music. Info: I went to this concert last year and it was amazing. I definitely recommend getting floor seats. Info: Although I can’t find any info on this online I’m pretty sure it’s a bike race. Location Centro Terminal del Sur. Info: This is a romantic music concert. Perfect or a date! Info: This is a classic car parade. And to be honest, it’s my favorite parade of the whole festival. It’s free and it’s pretty easy to get a good spot along Avenida Las Vegas. For more info check out the Classic Car Parade website. Info: This is 2 day rock concert. I don’t know any of the bands playing, however it’s a very popular event, the first day is sold out completely. For more info check out ColectivoSonoro’s website. Info: This is the biggest parade of them all. The best thing to do is to get tickets for a seat in the bleachers. Make sure to get there early because they always oversell. You can take your own liquor and food. For more information take a look at the Desfile de Silleteros website. The Walk of the Silleteros: Espectators use to chant: “When the silleteros go by, it is Antioquia going by”, this way expressing the pride of the rural tradition of the region. Main flowers used are pinocchios, lilies, carnations, agapanthuses, sunflowers, bridal veil, gladioli, chrysanthemums, roses, and orchids. Even Michael Jackson enjoys La Feria De Las Flores. What is the dates for the Santa Elena flower festival 2017? they say it is in august? Yes, it’s the first week of August. Hi, please do you know some schedule of the festival? Is there something happening on the weekend 28-30.7.? Thanks a lot! Sad news, but I think there is no more Desfile De Los Carros Antiguos starting this year. The cars will only be on display at two areas. Might want to double check on that but I did not see it in La Programacion.